Eltronicschool. - This is one of the radio frequency circuit schematic for you who want to build 434MHz in this time. This is circuit schematic of 434MHz RF Based Wireless Remote Control System. Beside we will give you circuit schematic of this 434MHz RF Based Wireless Remote Control System, we also will give you the global description of 434MHz RF Based Wireless Remote Control System from original source. 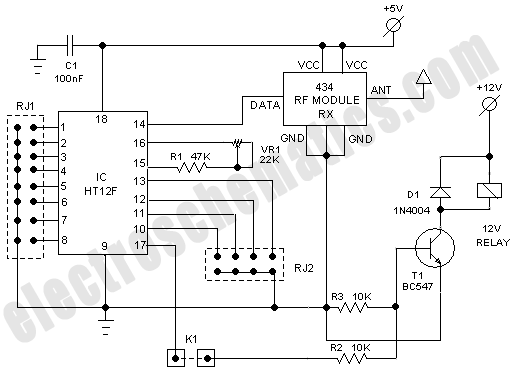 Circuit schematic like in Figure 1 above is 434MHz RF Based Wireless Remote Control System. 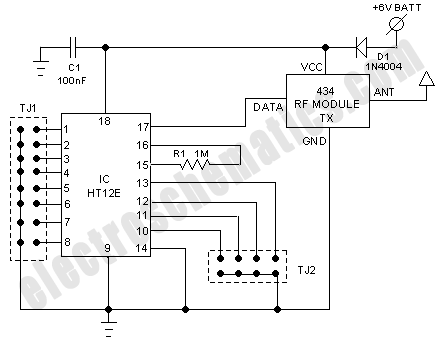 Accordingly Electroschematic site describe that this simple RF transmitter, consisting of a 434MHz license-exempt Transmitter module and an encoder IC , was designed to remotely switch simple appliances on and off. The RF part consists of a standard 434MHz transmitter module, which works at a frequency of 433.92 MHz and has a range of about 400m according to the manufacture. The transmitter module has four pins. Apart from “Data” and the “Vcc” pin, there is a common ground (GND) for data and supply. Last is the RF output (ANT) pin. The miniature 434MHz RF receiver module receives On-Off Keyed (OOK) modulation signal and demodulates it to digital signal for the next decoder stage. Local oscillator is made of Phase Locked Loop (PLL) structure. Technically, this is an Amplitude Shift Keying (ASK) receiver module based on a single-conversion, super-heterodyne receiver architecture and incorporates an entire Phase-Locked Loop (PLL) for precise local oscillator (LO) generation. It can use in OOK / HCS / PWM modulation signal and demodulate to digital signal.